Mouse anti Chicken TCRα/β antibody, clone L22 used for immunofluorescence studies. F distribution of lymphoid aggregates in the MacRed chicken gut. (A-I) External views of different regions of a 1-year-old MacRed chicken showing several scattered lymphoid aggregates in the jejunum (A-C), numerous scattered lymphoid aggregates in the ileum (D-F) and a high concentration of lymphoid aggregates in the ileum Peyer's Patch. Scale bars in A-I: 500 μm. (J-L) Immunofluorescence staining of Peyer's patches showing organisation of CSF1R-mApple-expressing cells (red) in relation to: (J) Bu-1+ B-cells (green), (K) TCR αβ (Vβ1)+ T-cells (green) and (L) CVI-ChNL-74.2+ macrophages (green). Scale bars in J-L: 100 μm. From: Balic A, Garcia-Morales C, Vervelde L, Gilhooley H, Sherman A, Garceau V, Gutowska MW, Burt DW, Kaiser P, Hume DA, Sang HM. 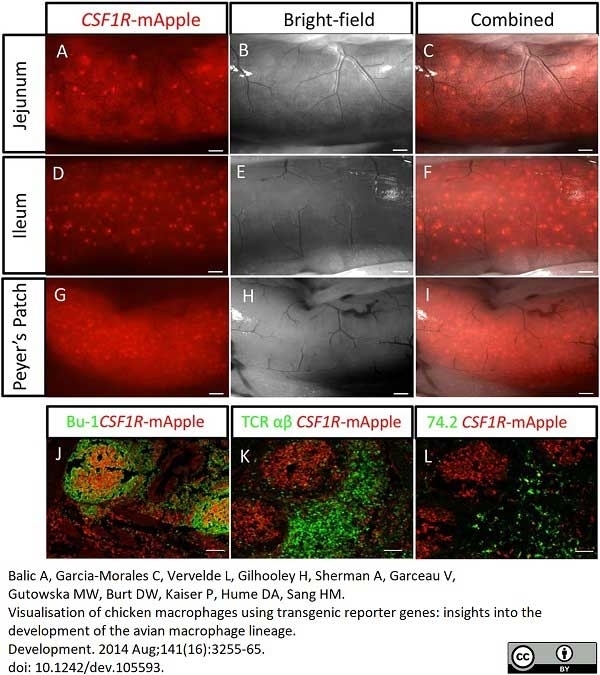 Visualisation of chicken macrophages using transgenic reporter genes: insights into the development of the avian macrophage lineage. Development. 2014 Aug;141(16):3255-65. Mouse anti Chicken TCRα/β antibody, clone TCR2 recognizes chicken TCRα/β expressed on peripheral blood T cells. Two distinct subpopulations of α/β T cells appear in the chicken thymus subsequent to the appearance of γ/δ T cells. These subpopulations, originally denoted as TCR2 and TCR3 arise sequentially in the thymus during ontogeny and are now known to represent two distinct Vβ families, Vβ1 and Vβ2, respectively. Mouse anti Chicken TCRα/β antibody, clone TCR2 is specific for the Vβ1.